Happy New Year! Erin Hodges from Fig + Cotton here today with another Effortless Entertaining post! With the post-holiday blues in full effect, low-key soirees can help ease the pain. 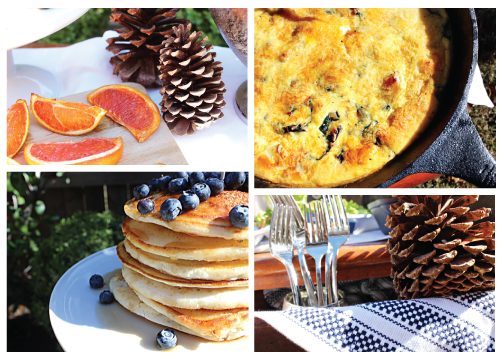 Simple, yet beautiful, home brunches are the perfect cure. Weekend gatherings with your friends and family should not be stressful; this is Effortless Entertaining. They should be relaxing for you and your guests, so there is no need to for a fussy menu that has you chained to the kitchen. The fail-proof recipe for any small gathering is (1) choose multiple menu items you can make the day before so you aren't scrambling the morning of the party, (2) don't be ashamed of buying a few pre-made(or at least pre-prepped) items at your local grocer or specialty food store to save you time, and (3) pick one show-stopper that is undeniably homemade. 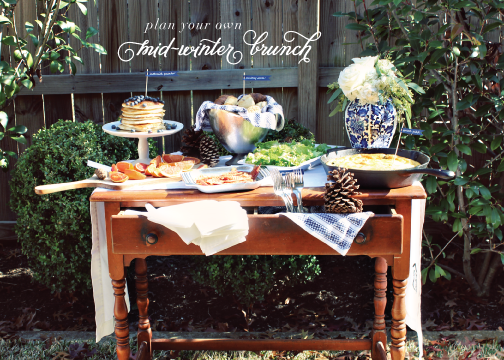 I did exactly that for the classic navy and white mid-winter brunch over the weekend. Make your grocery store run. Don't forget the pre-made baked goods and other treats! Oh, and don't forget the bubbles. 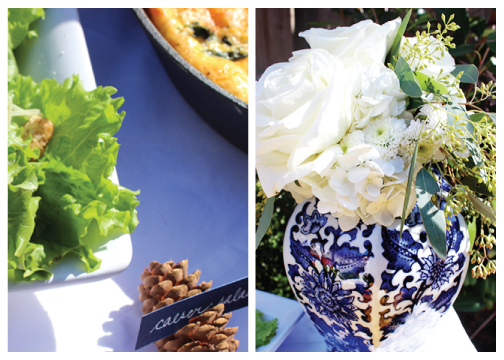 Plan your buffet or tablescape. I always jot a diagram down on a piece of paper so I know exactly where all the platters, napkins, etc. are located so I am not rushing around trying to find hidden serving pieces an hour before the door bell is going to ring. Make any place cards or food label cards, if necessary. Arrange your flowers. You can grab these at the grocery store when you go as long as you keep them out of the heat and in plenty of water. For tips on floral arrangements, try this post. Make your fritata, and place in the fridge when it cools. Lay out all of your platters, vases, and candle holders on your buffet/dinner table for easy food transport tomorrow. If you are having a sit down meal, go ahead and set the table. Cut the citrus and place in a Ziploc bag so they are ready for easy roasting. Reheat the fritata in the oven on 250 degrees until warm in the middle. 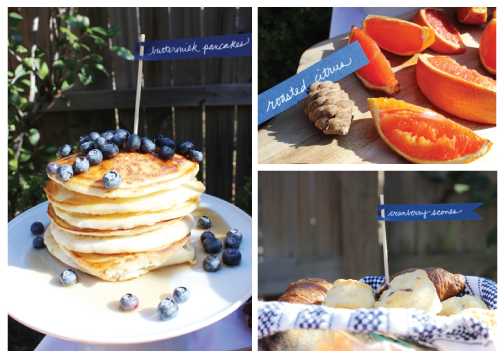 Make your pancakes and stack them neatly on a pretty cake plate. Cover with berries. Plate everything, and place out on the table. Have a glass of bubbly. You deserve it. I frequently entertain, and the most difficult part is working backward to figure out how long everything will take and thinking through the process to ensure everything is ready at the right time. This "timeline" is super helpful for that! More posts like this please! This sounds amazing and I love that there are some simple purchased items...that always helps!! Great tips as I hate when the hostess are running around scrambling and unable to enjoy the party THEY threw.